As long as you have power available, a freezer is one of the best ways to preserve food. Just about anything can be frozen – meat, vegetables, dairy products, bread and most other staples. Your freezer isn’t a miracle machine, though. To keep food in good condition for a long time you need to follow a few simple rules. Get it wrong and you’re likely to find your food deteriorating – and maybe even unsafe to eat. To safely store food for long periods of time, use a deep freezer that will keep the temperature at 0ºF or lower. It’s also a good idea to buy a freezer thermometer and check the temperature frequently. Keep the freezer as full as possible. A half-empty freezer will spill cold air every time the door is opened, letting warm air in. It has to cool that down once the door is closed again. In a full freezer there’s less space for warm air to take up. If there’s a lot of empty space in yours, put in empty cardboard boxes – they’ll help keep cold air inside. If you have a chest freezer this isn’t a problem, because the denser cold air will stay inside when you open the lid. Don’t load a lot of food into your freezer at once. That will overload the freezer’s cooling capacity, and raise the temperature inside. It will also take longer to freeze the food you just put in, and slow freezing reduces the quality of food. Don’t put in more than three pounds per cubic foot of freezer space every day. Don’t pack food in too tightly. 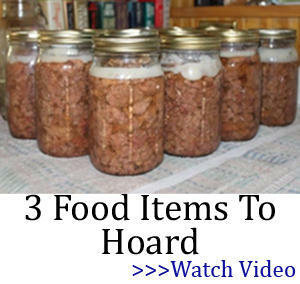 The water in it will expand as it freezes, so close-packed food can get damaged. On the other hand, if you want to freeze something more quickly put it against the side of the freezer. Before freezing your food, pack it in freezer bags. These protect against water vapor and leaks, they’re easy to seal, and you can write on them what the contents are. Good marking will make it quicker and easier to find what you want, so you won’t need to keep the door open – and letting cold air out – while you peer at bags to see what’s in them. If there is a black-out, your food will stay frozen for between two and four days, as long as you protect the freezer immediately. Leave it unopened; keep it in a cool place and insulate it by covering it with blankets or quilts (but make sure not to cover the compressor). This two to four-day rule applies to a full freezer; if your freezer is only half full then it might only keep food frozen for about 24 hours. If during a power outage the food in your freezer becomes thawed, you might still be able to refreeze it. If it’s only partially thawed and still has ice crystals, and the freezer temperature never went above 40ºF, it should be safe to refreeze. Otherwise, eat it right away. 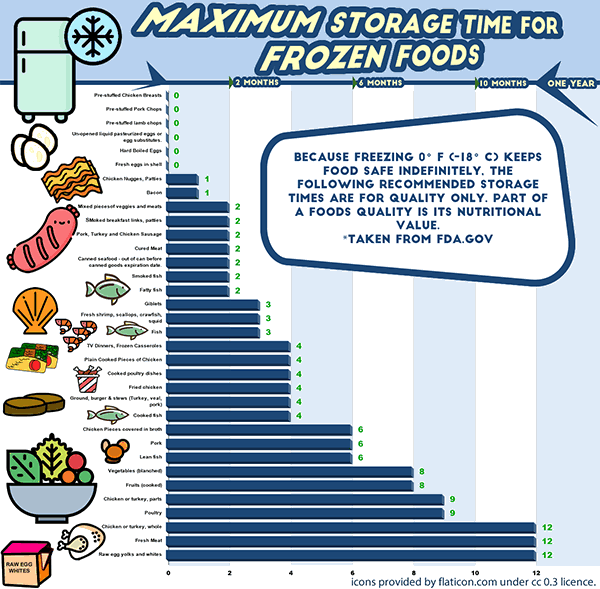 Food can remain frozen indefinitely and technically be safe to eat, as bacteria will not grow. However, over time all frozen food will deteriorate in quality and become unappetising to eat when defrosted. The time it takes for : Also, you should know that the chart above has some variations depending on the specific type of food. My freezers are kept at the coldest temperature setting to help prolong food storage. I also keep an eye on the door seals making sure there isn’t anything on them to break the seal. It happens with chest freezers all too easily so keep an eye on them. Frozen food is a matter of inspecting it before cooking and eating. Took some salmon out the other day I vacuum sealed in 2012 while in Alaska. Had a little freezer burn on it so I pressure cooked it and canned it. I’m sure it will be fine. I did throw away several packs of vegetables and fruit , just too far gone. Chickens loved all of it. So ultimately if my family does not eat it the chickens will or the compost pile will gobble it up. Either direction none is just thrown away. Would not necessarily go by this chart. I agree, Wannabe, charts are general purpose and can’t possibly cover all locations both geographical and physical. I am quite confident that some freezers struggle at certain times of the year in certain geographical locations. Also depends upon how many times a week one visits the freezer and as the article pointed out how much dead space there is in the freezer. Too many variables to have a one chart fits all solution. Just G.P. guidelines. Mine is filled with 2 liter bottles of water, need the frozen bottles, and helps the freezer. need to can the meat, but this works for now. Been eating meat from our own cow that has been frozen 3 years. We weren’t sure either. Tasted fine, we are fine. Take a plastic juice bottle, fill it 1/2 full of water, lay it on its side in the freezer. After the water freezes stand it upright. If there is an extended power outage that you do not know about, not at home or whatever, and the power comes back on, the water will have melted to the bottle bottom and refreeze, which indicates to you that there has been a power outage. How appropriate, since I just thawed a 5 gallon bucket of lard…one that has doubled in price since I bought it; from $25 to $50. I put the lard in cool whip plastics and refroze. You didn’t mention vacuum sealing. I vacuum sealed meats and they lasted for years–as good when eaten as when packed. i vacuum pack meats but I like the idea of freezing meats in water. No air and a good start on a broth for a soup, stew or gravy. Going full off grid solar with my newer mobile home on the property. Then going solar with 12v deep well pump and pressure tank. Its a good well just no pump in it since the stepson sold everything he could get his hands on here while I was away. I’d set up with a hand cranked boat trailer winch for backup but solar Array and pump will be good and power my sewing room as well. I used to dry a lot of things but time hasn’t been on my side for that the last three years. Dry. Store in glass containers away from sunlight. Stuff kept nice for years. I have had a solar dryer but much of what I did was on window screens or old bed sheets. It was good for large volumns of stuff salvaged from gleaned fields or produce trucks that wrecked on the interstate nearby. Moving back things will settle down and things redone or newer things are in the works. My current rootceller is a burried barrel. I have plans for a 3/4 burried room near the mobile home. Can’t do a proper basement under the trailer. :) Time.. Time… Time… That’s the biggest thing. This week has been spent digging trenches 24″ deep for power and water lines. When not on the backhoe I’m painting. I refuse to live with blah beige. The master bath is now the color or a clear midday western sky. The cabinets and an old dresser will match but will have raised stenciled patterns dry brushed with white. The cappucinno kitchen was attractive but too dark. As of last night the cabinets and one wall are silver swordplay gray. The second wall will be the gray mixed 50/50 with white. I’ll start on that tomorrow. The livingroom will be silver sage. I’ll start that next week. I like my food like my home, colorful and attractive. Shade drying helps preserve some color better than in direct sunlight. Freezing is even better but I’m cutting back on power usage. Its easier for my goal of staying out of debt. I’m investing for a future with fewer monthly bills. Clergy lady is certainly leading the off-the-grid life and has a huge head start on us suburbanites who will have a monstrous learning curve if we survive. Recent medical issues with wife and me may make it all moot anyway. I’ve been gimping around with a cane for the last week. Kind of puts a huge crimp in any kind of bugging out except by motor vehicle. Now where was that article about fortifying one’s home? Sorry to hear about you and your wife’s ailments. Age catches up with all of us. I will pray for you both for healing and good health. Dave: While rain water from your roof is very helpful and can be purified, it is not as clean as water that falls from the sky into a clean container. Dust from numerous sources settles on your roof, birds fly over your roof, depending upon your roofing material, it may shed some of the chemicals used in manufacturing the shingles during a rainstorm. In short, there are many contaminants contained in the water flowing off your roof. While screened, sediment settled roof rainwater can be used for many purposes, I would filter the water through either a Berkey or a Katadyn water filter or home-made sand filter before I used it for cooking and drinking. If you live in an area with adequate rainfall it is true, you can collect an amazing amount of rainfall water. Watch for end of summer sales and buy kiddy wading pools. They are usually stackable so when storing they don’t take up too much room. I bought six of them for $30 from War-Mart two summers ago. When there is going to be a rainstorm I put them out in various areas to collect rainfall. Even though they collect rainfall directly from the sky there is an accumulation of dirt on the bottom of the pools after the rainfall. I was really amazed after the first rainfall to see so much dirt in the pools. It gave me a good supply of water to use on my plants but would take a lot of work to make it potable. Hope you’re getting better Chuck. My well water here is good. 38 degree river flowing out of my mountain as an underground river in an ancient lava tube. Tests as some of the best water in the state. Well worth pumping this water. Cleaner than rain but I do plan a rain catchment system as time goes on. Good for watering the gardens.